Encinitas CA— Come join us for a spectacular fundraiser with entertainment and desserts. Cabaret Night is filled with a wide variety of acts by students from the Musical Theater Production and Instrumental Music classes. Some of the acts will include songs performed from hit Broadway Musicals, a quick ComedySportz game, live band performances, short scenes, and a Hamilton medley collaboration by the music and theater students. During intermission, delicious desserts will be served. 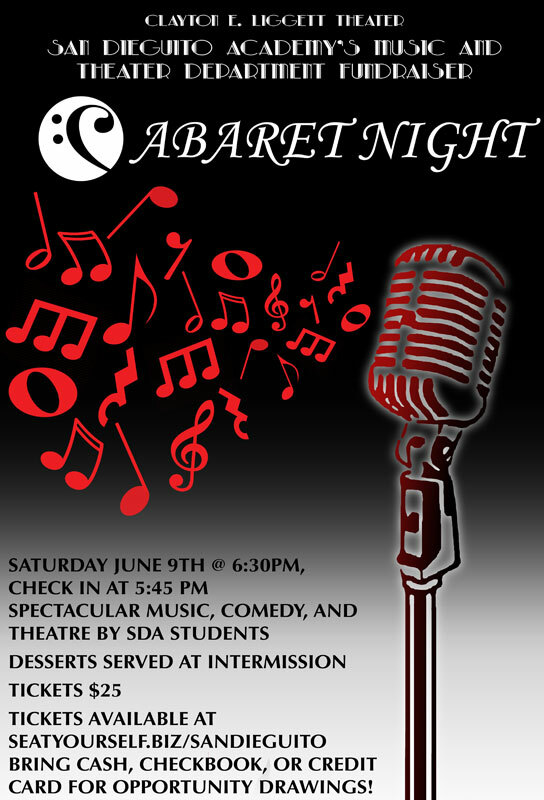 Money raised from Cabaret Night will help towards funding the Theater Arts Department and Music Department. The show is on June 9th, 2016 at 6:30 PM at San Dieguito Academy’s Clayton E. Liggett Theater. The ticket price is $25.00 per person. Tickets can be purchased at http://seatyourself.biz/sandieguito. Check in will begin at 5:45 PM and the show will begin at 6:30pm.